Fat bikes have exploded in popularity over the last few years. Their ease of use and increased stability in the snow and other rough terrain has widespread appeal. In addition, many riders — new and experienced alike — have looked at fat bike models to try. As with any piece of quality outdoor gear, you’ll want to consider the cost of trying your hand at fat biking. Thankfully, there are models for every budget. Here are seven of the best options. At the low end of the fat bike totem pole you’ll find the Mongoose Dolomite, which will run you $250. While technically a fat bike, the Dolomite isn’t recommended as a real mountain bike for rough terrain. It does feature a geared drivetrain, steel frame and dual disc brakes, but it’s still best for those who want to see if fat biking is for them. Gravity offers some very solid bikes at very affordable prices. The Deadeye Monster is a single-speed models that features a sturdy alloy frame, chromoly fork, Tektra Novela disc brakes and 4″ tires. Another reliable bike from Gravity, the Bullseye Monster is equipped with a SRAWM X4 drivetrain (something the Deadeye doesn’t offer), as well as 4″ tires and Tektro Novela disc brakes. The Motobecane Boris features a hydro-formed aluminum alloy frame, low-level SRAM drivetrain and 4″ tires. Even at $800, this is a quality model that would make a great option for your first fat bike if you take a liking to the sport. While listed at just under $1100, I’ve actually seen this one for as little as $900 on some sites, so you’ll want to shop around for the best price. The Big Ol’ Fat Bike features a strong chromoly steel frame, SRAM 3×9 drivetrain, mechanical brakes and 4″ tires. The Motobecane Sturgis Bullet comes with an aluminum frame, RockShox Bluto suspension fork, 4.5″ tires and a SRAM X5/X7 2×10 drivetrain, making it the most budget-friendly fat bike you’ll find with a Bluto fork. 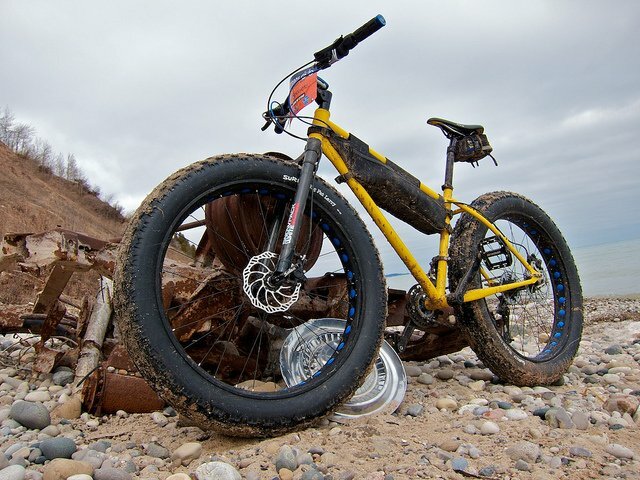 Rounding out our list is the fat bike that pioneered the craze: the Surly Pugsley. This beast comes with a steel frame and components hand-picked for their durability and serviceability. The Pugsley is also well-suited for bike-packing, your daily rides and expedition-class rides. It is a bit on the heavy side, though, so keep that in mind.